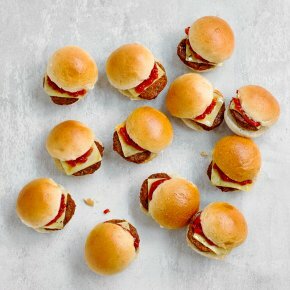 18 mini pork and chorizo burgers, topped with Cheddar cheese and red pepper relish, in a broiche roll. Everyone will love these appetising, flavoursome burgers. Why not serve alongside our Cheese & Tomato Pizza for an effortless way to feed a hungry crowd.